Then, as I was working on my blog one day, I saw a new feature in the Page Elements section: I could now add a favicon right from there! Awesome! No complicated html coding, no hosting images on other sites, and guess what? It doesn't even have to be a .ico file! Are you as excited about this as I am? I think this rocks. A favicon is 16 pixels square, so use your favorite image editing software to make a really awesome (and tiny) icon. Remember that since it is so small, simple is best. I tried uploading my favicon as both a .jpg and a .png, and I don't remember which one ended up working. Sorry! Maybe either would work? 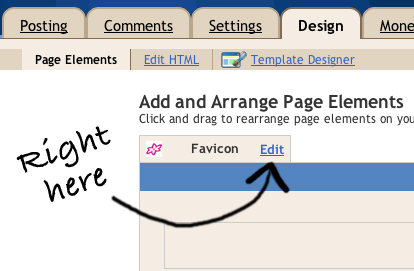 Once your image is ready, just go into Page Elements, and click to Edit your favicon. Upload your favicon and save. It took a few minutes for my favicon to actually appear on my blog for some reason, but it did work, and it was really easy. Have fun making your awesome blogs even better! I really like your favicon! I made one for myself this week the same way! It is so much fun having a unique favicon I think. That's a cute favicon. I'll have to make one too.